This is a manicure that I wore while at the cottage. I feel like tribal print is perfectly representative of summer. Any time that the sun or the beach is involved, my mind instantly gravitates toward tribal prints. It's such a fun, crisp pattern and I don't think I'll ever get tired of them. Here I tried something a bit different- a half nail design. I really like the finished product. It's a fun way to show off both the base colour and a cool design! For this look I used China Glaze Flip Flop Fantasy with Art Club Electric Universe for the tribal print. really lovely. i cant seem to get my hands on flip flop fantasy yet though! These are awesome! Yay for Flip Flop Fantasy lol. 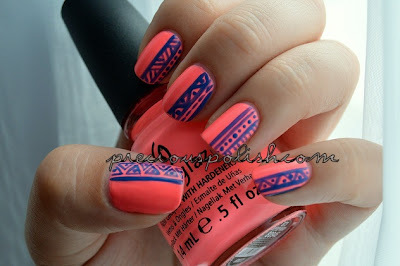 Your tribal designs are beautiful and I love the color you chose to do them in! Thank you, I'm glad I've changed your mind a bit :D I'd love to see your take on it! !